Critical Distance Centre for Curators (CDCC) provides opportunities for curators and artists to mount fully realized exhibitions and projects within a critical framework. Through a wide-ranging annual program supplemented by special projects and partnerships and supported by the production of original publications, editions, and others events, CDCC is an open platform for diverse curatorial practices and perspectives, and a forum for the exchange of ideas on curating and exhibition-making as a way to engage and inform audiences from all walks of life. TYPOLOGY is pleased to present OF OTHER FACES, a group exhibition featuring five artists whose works employ strategies of mirroring and doubling to investigate the paradoxical nature of our dualistic world. Through the representation or evocation of reflections, echoes, or iterations, the photographs, sounds, and videos of Andrea Cohen and Wiska Radkiewicz (Paris, New York), Victoria Fu (Los Angeles), Marta Ryczko(Toronto), and Manuel Saiz (Berlin) interrogate, express, or reveal hidden contradictions within contemporary social systems as they relate to dualities of self and Other. Whether the Other is cast variously as the embodiment of nature, the irretrievable past, the imperfect, or the unknown, the works within the exhibition represent our uniquely human attempts to integrate with that uncanny object of our deepest fear and desire, the unknowable within ourselves. 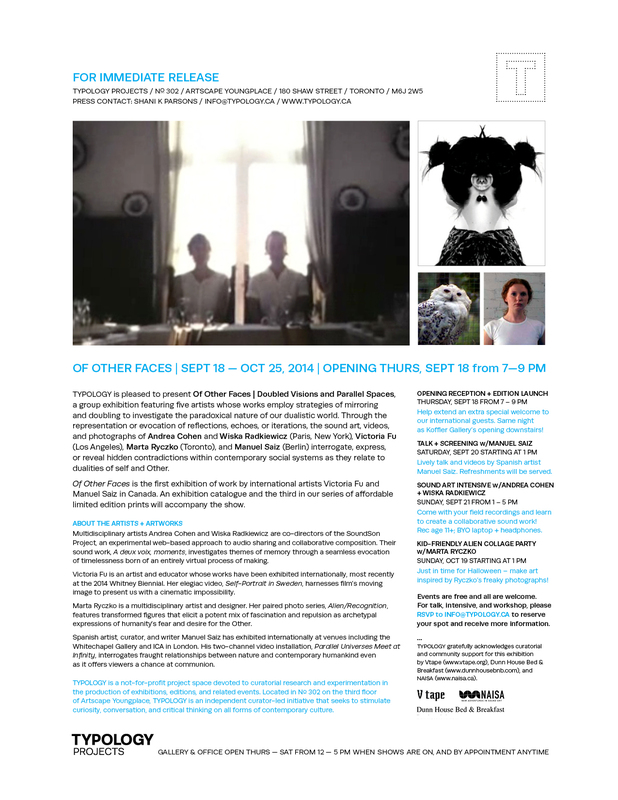 Of Other Faces is the first exhibition of work by international artists Victoria Fu and Manuel Saiz in Canada. A full-colour exhibition catalogue with original curatorial essay and artist interviews will accompany the show, as will the third in our series of affordable limited edition prints. Exhibition-related events will include an artist talk and screening by Manuel Saiz, kid-friendly collage workshop by Marta Ryczko, and collaborative sound art intensive by Andrea Cohen and Wiska Radkiewicz. See below for event dates and more information. Opening the same night will be Koffler Gallery’s fall exhibition, Pardes, featuring four Israeli sound and multimedia artists — enjoy double the art at Youngplace this evening! Multidisciplinary artists Andrea Cohen and Wiska Radkiewicz are co-directors of the SoundSon Project, an experimental web-based approach to audio sharing and collaborative composition. Their sound work, A deux voix, moments, investigates themes of memory through a seamless evocation of timelessness born of an entirely virtual process of making. Victoria Fu is an artist and educator whose works have been exhibited internationally, most recently at the 2014 Whitney Biennial. Her elegiac video, Self-Portrait in Sweden, harnesses film’s moving image to present the viewer with a cinematic impossibility. Marta Ryczko is a multidisciplinary artist and designer. Her paired photo series, titled Alien/Recognition, features transformed figures that elicit a potent mix of fascination and repulsion as archetypal expressions of humanity’s fear and desire for the Other. Spanish artist, curator and writer Manuel Saiz has exhibited internationally at venues including the Whitechapel Gallery and ICA in London. His two-channel video installation, Parallel Universes Meet at Infinity, interrogates fraught relationships between nature and contemporary humankind even as it offers viewers a chance at communion. Critical Distance Centre for Curators (CDCC) was founded in 2013 under our former name, TYPOLOGY. Established as a not-for-profit space devoted to curatorial and artistic experimentation, we devoted our first three years to providing opportunities for curators and artists to mount fully realized exhibitions within a critical framework. In 2016, we relaunched under our new name (CDCC) with a new Board of Directors and a commitment to meet the need, voiced by local and national curators, for a truly vital curatorial community—one that both supports emerging and underrepresented curators, and advances curatorial practice and inquiry. 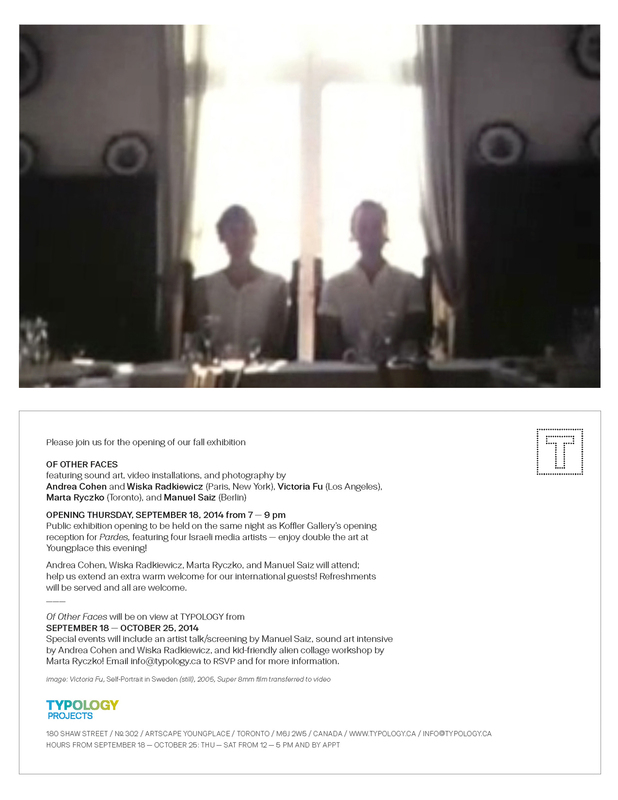 Of Other Faces took place in CDCC’s exhibition space in 2014 under our former name, TYPOLOGY, and was curated by CDCC’s Founding Director, Shani K Parsons. News, press, publications and more information. Hover for info; click to enlarge image and view full captions. Of Other Faces, curated by Shani K Parsons, installation view, TYPOLOGY Projects, 2014. Of Other Faces, curated by Shani K Parsons, installation view with work by Marta Ryczko, Andrea Cohen and Wiska Radkiewicz, TYPOLOGY Projects, 2014. Marta Ryczko, Alien/Recognition (Mimi), 2011/2014, in Of Other Faces, curated by Shani K Parsons, TYPOLOGY Projects, 2014. Of Other Faces, curated by Shani K Parsons, installation view with work by Andrea Cohen and Wiska Radkiewicz, Marta Ryczko, and Victoria Fu in Of Other Faces, curated by Shani K Parsons, TYPOLOGY Projects, 2014. Victoria Fu, Self-Portrait in Sweden, 2005, video installation, in Of Other Faces, curated by Shani K Parsons, TYPOLOGY Projects, 2014. Victoria Fu, Self-Portrait in Sweden, (still), 2005, video installation, in Of Other Faces, curated by Shani K Parsons, TYPOLOGY Projects, 2014. Of Other Faces, curated by Shani K Parsons, installation view with work by Manuel Saiz, Marta Ryczko, and Victoria Fu, TYPOLOGY Projects, 2014. Manuel Saiz, Parallel Universes Meet at Infinity, (installation view), 2004, in Of Other Faces, curated by Shani K Parsons, TYPOLOGY Projects, 2014. Manuel Saiz, artist publication, (detail), in Of Other Faces, curated by Shani K Parsons, TYPOLOGY Projects, 2014. Of Other Faces, installation view with work by Manuel Saiz, (detail), in Of Other Faces, curated by Shani K Parsons, TYPOLOGY Projects, 2014. Andrea Cohen and Wiska Radkiewicz, À deux voix, moments, 2009, sound (CD), from Of Other Faces, curated by Shani K Parsons, TYPOLOGY Projects, 2014. Of Other Faces, exhibition catalogue, (detail), Of Other Faces, curated by Shani K Parsons, TYPOLOGY Projects, 2014.